Thanksgiving around the world. Learn about harvest festival in different cultures. Throughout history many cultures have given thanks for a bountiful harvest. They might differ in their forms and presentations. But their spirit - setting aside a date to reflect on life's blessings, remains the same. Catch a glimpse of the spectra of colors and shades that tinge the thankful celebrations from around the world! As evident from most of the cultures people would associate these with harvest festivals in gratitude of the God who protects them and their crops. Harvest festivals and thanksgiving celebrations held by the ancient Greeks, the Romans, the Hebrews, the Chinese, and the Egyptians all reflect the similar spirit. The Kaleidoscope here depicts the spectra of celebration as practiced by these different cultures. Even in prehistoric times, the first Americans observed many rituals and ceremonies to express gratitude to a higher power for life itself. A Seneca Indian ritual, for example, states, "Our Creator...Shall continue to dwell above the sky, and this is where those on the earth will end their thanksgiving." Another quotation of the American Indians attributed to a later period. 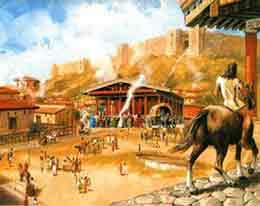 But that too was well before the day the Europeans came to know about America. It was: "The plant has its nourishment from the earth and its limbs go up this way, in praise of its Maker...like the limbs of a tree." In South America, many of the native Indian cultures contain expressions of gratitude and thanksgiving, and in modern Brazil a special public day of thanksgiving and prayer has been designated for the fourth Thursday of November every year since 1949. The ancient Greeks worshipped Demeter as their goddess of all grains. Each autumn the festival of Thesmosphoria was held to honor the goddess. On the first day of the festival married women would build leafy shelters and furnish them with couches made with plants. On the second day they fasted. On the third day a feast was held and offerings to the goddess Demeter were made - gifts of seed corn, cakes, fruit, and pigs. It was hoped that Demeter's gratitude would grant them a good harvest. For over 3000 years Jewish families have been celebrating an autumnal harvest festival called Sukkoth. Sukkoth begins on the 15th day of the Hebrew month of Tishri, 5 days after Yom Kippur the most solemn day of the Jewish year. Sukkoth has derived its name from the huts (succots) that Moses and the Israelites lived in as they wandered the desert for 40 years before they reached the Promised Land. These huts were made of branches and were easy to assemble, take apart, and carry as the Israelites wandered through the desert. The festival coprises two main events - Hag ha Succot - the Feast of the Tabernacles and Hag ha Asif - the Feast of Ingathering. During this 8-day long festival the Jews build small huts of branches which recall the tabernacles of their ancestors. These huts are constructed as temporary shelters, as the branches are not driven into the ground and the roof is covered with foliage which is spaced to let the light in. Inside the huts are hung fruits and vegetables, including apples, grapes, corn, and pomegranates. On the first two nights of Sukkoth the families eat their meals in the huts under the evening sky. 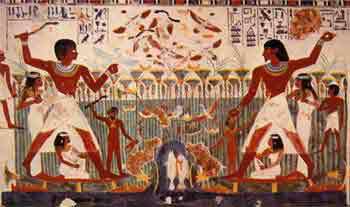 The celebration of the spring-time harvest festival by the ancient Egyptians was dedicated to the honor of Min, their god of vegetation and fertility. Spring being the harvest season of the Egyptian's the festival was held during this season. The festival featured a parade in which the Pharaoh took part. After the parade a great feast was held. Music, dancing, and sports were also part of the celebration. When the Egyptian farmers harvested their corn, they wept and pretended to be grief-stricken. This was to deceive the spirit which they believed lived in the corn. The Roman celebration of Cerelia, a harvest festival, was dedicated to the honor of Ceres. Ceres was their goddess of corn (from which the word cereal comes). It was also an autumnal festival held each year on October 4th. Offerings of the first fruits of the harvest and pigs were made to Ceres. The celebration included music, parades, games and sports and a thanksgiving feast. This was a glimpse of the overwhelming unity in the spirit of the thanksgiving celebration in all ancient cultures across the world. Prayer, parade, feast and the fervor are common to most of them, though the mode of celebration differs. Wish you a VERY HAPPY THANKSGIVING!